Seth is the Project Manager for City Central at the HAC, he has been with Ultimate Experience since September 2017. He recently took part in a charity cycle in Africa to raise funds for Child.org. 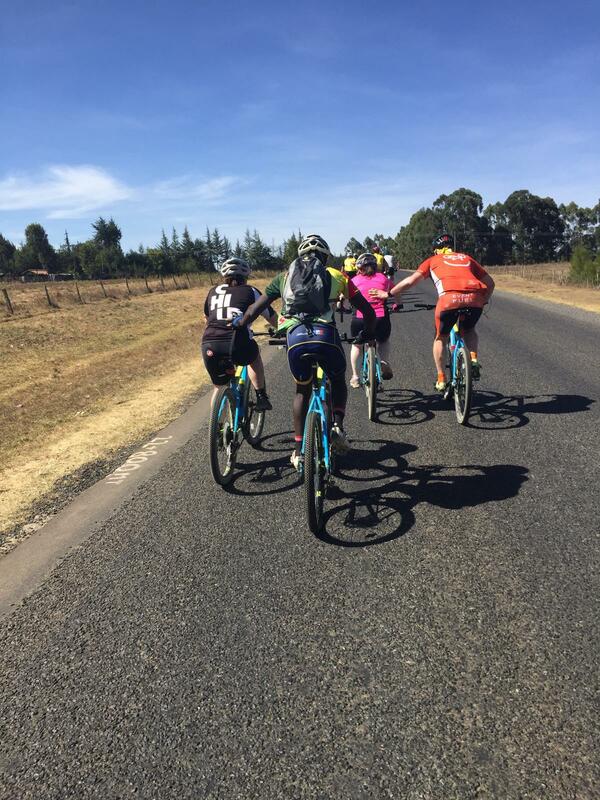 He was joined by 6 colleagues from CH&CO Group and together they cycled from Nairobi to Meru over 500km in 5 days. Check out some of the highlights of his trip. It’s been a slow, peaceful start to Day 1 of what promises to be quite the opposite from here on in. We’ve had saddles, pedals, camera bags and teddys mounted to our bikes followed with a quick lap of the car park to check which brake leaver offers the best skid. Whilst the rest of the 25 strong group complete the standard bicycle faff, I’ve walked around the lodge passing zebras and water buck while staring in awe as herds of giraffes wander by without a care. 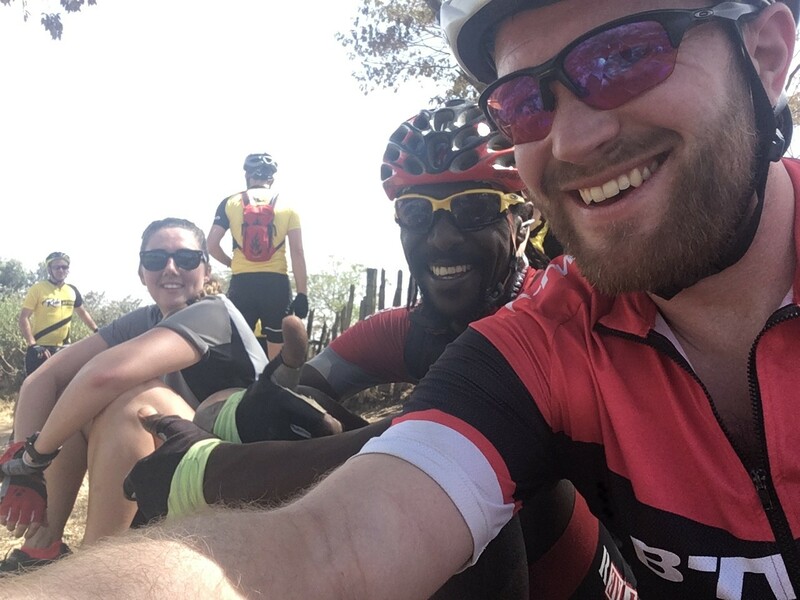 A final fueling and hydration session quickly followed as we, without exception, excitedly got on our bikes for a 30km circular route into Hells Gate National Park in Rift Valley through deep sand, rough rocks and past baboons with a penchant of Tribe energy bars! While for some the distance may not seem too arduous, we start at an altitude rivaling the highest elevation of most ski resorts in the alps and only go up from there, until we come down!! Today we set off from Lake Naivasha to Nakuru, initially along some tarmac dotted with potholes that were certainly bigger then ones I succumbed too on my trusty Brompton along Oxford Street a few months ago. After 50km, lunch and a video call to UE head office, we headed up our favourite rocky, sandy roads that were void of any motorised vehicles. Depending on who you ask, today has been either the most enjoyable day riding or the least. We had a constant climb for 35km (not the 20km thought!) at the start of the day, taking around 100 minutes and testing everyone’s mental strength. 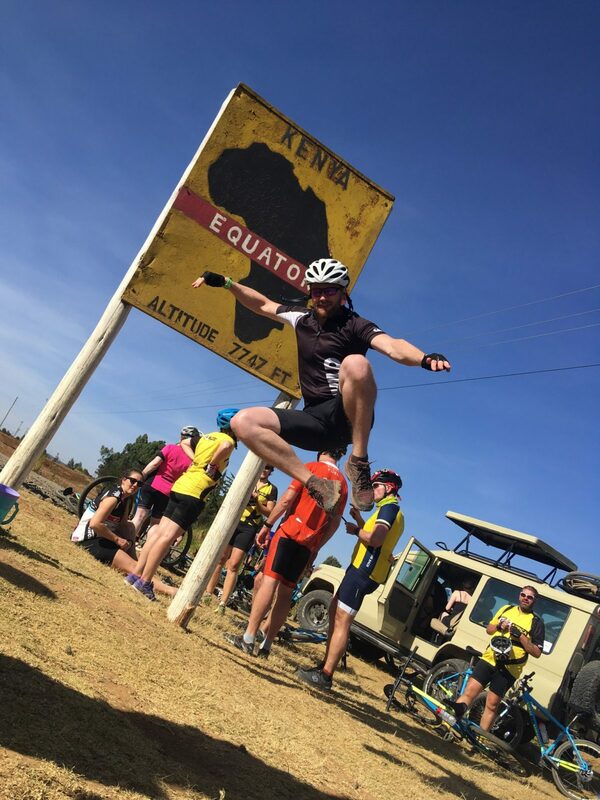 There were a few stops but the most dramatic and gut wrenching incident occurred when Andrew ‘Domino’ Merrett thought cycling was a contact sport and came out second best to the Kenyan tarmac. Bruised, cut and wearing remnants of the road Andrew never lost his smile or sense of humour and was deservedly awarded ‘hero of the day’ and ‘most likely to hurt themselves’ …we all hope the injuries and pain are superficial and we get to ride with him tomorrow. After lunch, like a pro team of 30 riders travelling at 20kph, we stuck together and battled the head winds over the rolling hills and crossed the equator into the northern hemisphere at an altitude of just under 8000ft.Our stop for the night was Thompson Falls high up in the mountains. We took our opportunity to wear trousers and jumpers we thought we would need in 30 degree heat and after a quick hydration and feed all headed to bed for an early night ready for the prompt start and 120km. Today we went from Nayuki to Meru and for those who can remember the detail, this is our final destination. We are here for two nights and completing the final distance (circa 80 km) on our way to and from the projects Child.org are providing local communities. To the days ride. 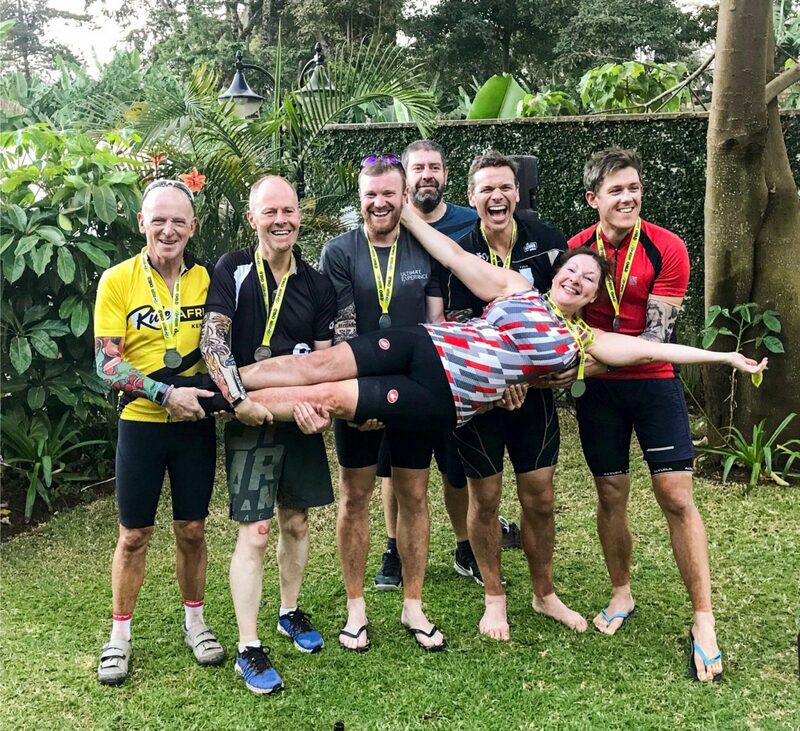 When 30 relatively unknown adults come together, push themselves physically and mentally, and live in relatively confined quarters you’ll be forgiven for a few sore tongues. Much to the groups chagrin, my tongue is not sore . The first half of the day seemed eerily efficient, arriving at our lunch destination in good time. From here we took an adventurous path through a rhino sanctuary with trails rivaling any mountain biking destination. The vista overlooking the plains and wilderness were quite breath-taking and well worth the baboon bottom we’ll wake with tomorrow. After stopping and taking photos of what may have been rhinos or moving rocks we headed into the plains with a thunderous sky line on the horizon. The skies have been a wonderful blue since we landed in Nairobi and to see such a threatening cylindrical mass appearing (out of the blue) was quite a site – I’m glad to say it is one of the only times I have smelt rain but not felt it. 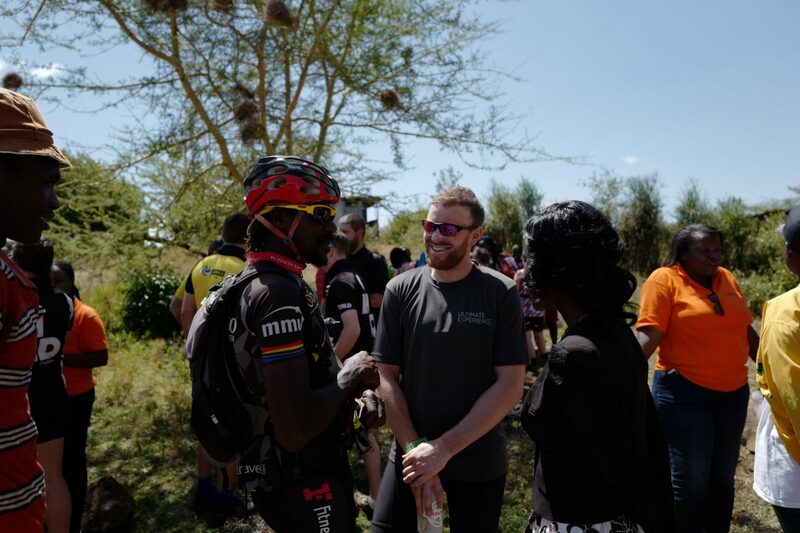 Arriving into Meru certainly felt like an achievement and while we have some more cycling to do, it will be speaking and seeing the women and children that the projects your donations have gone too that is the really reason we are here. Our last day on our bikes together will be remembered for many reasons. A long downhill route through villages and towns to the first of three groups we visited that have been created as part of the work Child.org are doing. We saw and heard about the educational and nutritional programmes offered to young, often single mothers and how these are used to support their children. With all of our visits into these communities, we were greeted with high octane smiles, beautiful songs and a hip shimmy or two. The British in us certainly felt a little embarrassed being greeted with such openness but I’m sure we will all go home and spread this positivity. At our final stop we had lunch with around 80 of the women we had meet during the day after which each group performed a good bye dance or, in one particular case, read out a poem they had written about their experiences from Female Genital Mutilation (FGM), “religion, education, family”. It was very powerful and provided further insight into the importance of the community programs that these topics are being spoken about and changes being made. Rather emotionally drained and physically tired we had 45km to go to get to the 500km mark with the long downhill we had enjoyed in the morning our final obstacle. Fueled with nuts, water, and energy bars from our awesome entourage we set off to complete our task and end the six days in spandex with an ice cold Tusker.